These Slate Grey Marble Heavy Duty Rubber Tiles are ready to work! 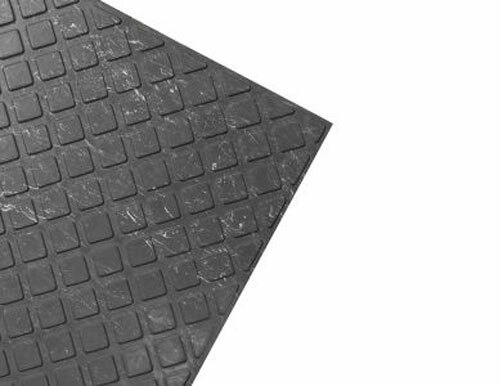 This anti-slip flooring solution comes in 24″x24″ square sizes with an aesthetically pleasing diamond pattern throughout. Sure-Foot’s slip resistant flooring products are perfect for heavily traveled areas such as shopping malls, hospitals, schools, office buildings, hotels, medical buildings, and churches. Made with the highest quality rubber, these tiles are built to last and made for easy cleaning. Anti-slip flooring from Sure-Foot Industries is the best choice for industrial, commercial and institutional buildings. We’re an industry leader in safety, and all of our heavy duty anti-slip stair treads and tiles exceed ADA recommendations for slip resistance. Want to learn more about increasing foot traffic safety and preventing trips and fall risks? Contact us or request a product sample today!